Black Diamond Live Casino is a popular online casino that specializes in live games. This live casino is powered by software developed by Visionary iGaming. We have an exclusive offer for new Black Diamond Casino customers! 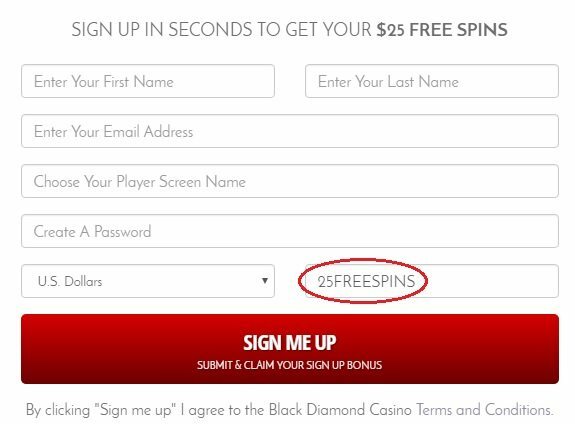 Register your new account with the Black Diamond bonus code 25FREESPINS and receive 25 free spins with no deposit necessary! The Black Diamond no deposit bonus is available to all first time registrants. Register your new account with the bonus code 25FREESPINS to qualify for this no deposit bonus of 25 free spins. Any winnings get added to your account as a bonus. There is a 75x wagering requirement on this bonus with a maximum withdrawal amount of $100. You must make a deposit prior to placing a withdrawal. 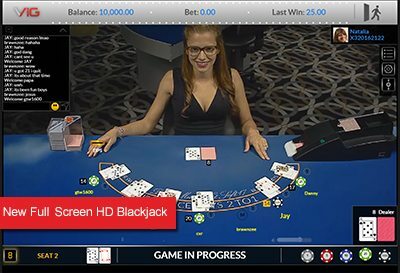 Let’s take a look at the live casino features, the games available and a promotional structure you can use to maximize your bankroll and your odds. Black Diamond features three live casino games: Baccarat, Roulette and American Blackjack. Games can be accessed through a desktop PC or laptop as well as most mobile devices. American Blackjack is the classic casino game 21 using the rules common in Las Vegas. It has a six-deck shoe, dealer hits on soft 17, there’s no surrender option and bets range from $5 to $500. Roulette is playable in both Double and Single Zero formats. Live Baccarat features traditional baccarat but also Super 6, which has the banker and player at even money except when the banker wins with a six. All live games stream at up to 1080p HD video. Picture-in-picture with integrated graphical elements gives you the excitement of live games plus all the information you need. Games feature elaborate histories to track your progress, and a live news ticker ensures that you never miss a beat. The live casino games are optimized for both desktop and mobile play. Deposit bonuses are provided via a series of daily specials that run Monday through Sunday. Each day has between two and four promotions, and you can take advantage of the one best-suited to you on any given day. These are match bonuses where the house matches your deposit by a certain percentage. On Monday, you can receive 150 percent on any deposit up to $200 and 200 percent if you deposit $200. The Tuesday special ranges from 150 percent on $200 to 300 percent on $1,000. On Wednesday, you’ll receive as much as 250 percent on a $500 deposit. Thursday maxes out at 300 percent on $1,000, and Friday lets you grab 250 percent on just $200 or more. Saturday yields an impressive 350 percent on $1,000, and Sunday gives you 150 percent on any deposit or 200 percent on a $200 deposit. If you claim a bonus, withdrawals are blocked until you’ve met certain playthrough requirements. These wagering requirements can vary from one promotion to the next. In general, there’s a standard you can expect. On free bonus money, such as a no deposit promotion, you must play through 99 times the bonus amount. If you take advantage of a sign-up bonus, you must wager 75 times the bonus and the deposit used to claim it. If you claim standard bonuses, such as the daily specials, the requirement is only 25 times the bonus and the deposit, which is quite low relative to other online casino. Note that any cash-back bonuses you receive have no rollover requirements, and you can immediately withdraw your money. Be mindful that not all games contribute at a 1:1 rate for the rollover requirement. Slot games do, so each $1 you bet on slot machines is $1 toward the playthrough requirement. Video poker, however, only contributes 20 percent. Games that contribute only 10 percent include Keno, Roulette, Casino War, Mini-Baccarat and Weed Whacker. Blackjack, on the other hand, contributes only 2.5 percent. In addition to the 25 fre spins no deposit bonus and the daily reload bonuses, the Black Diamond Casino has many other fantastic promotions running. A cool aspect of Black Diamond Casino is that it has a regular tournament schedule. In most cases, participating is simply a matter of playing the games you’d play or making the deposits you’d make anyway. This tournament has a guaranteed prize pool of $200,000, and you can enroll every Tuesday, Thursday and Saturday. The pot can exceed $200K, and to cash in, you just have to reach top 20 on the leaderboard. Entry requires a $500 deposit, which you can pair with a daily special reload bonus, and the leaderboard counts every dollar you wager on any live or virtual game at Black Diamond Casino. The $15K skirmish guarantees a $15,000 prize pool and is open to join every day of the week. To win, you just have to reach top 15 that day. This is a one-day tournament that begins anew each day. To enroll, simply make a $75 deposit, which you can pair with any of the daily specials. Master of Roulette is a weekly roulette tournament that gives a $5,000 prize to the winner. This tournament encompasses all roulette games, both live and virtual. You’re automatically registered in any week in which you make at least a $50 deposit. After that, each dollar you bet on roulette goes toward the leaderboard, and the top 10 finishers all win at least $100. The Free Spins Tournament at Black Diamond Casino is focused on slot machines and other slot games, and you don’t even need to make a deposit to join. You’re automatically enrolled. These tournaments run from Monday through Sunday. Every $10 you wager on games selected for that week give you one Tournament Point. Earn TP to rise up the ladder. At the end of the week, first place wins 100 free spins, and 2nd, 3rd, 4th and 5th win 75, 50, 25 and 10 free spins, respectively. The $5K Shopping Spree promotion is a monthly opportunity that requires just a $100 deposit at any point during the month. After that deposit, each $1 you wager will give you one Tournament Point. Your TP accrual will determine your place on the leaderboard. Multiple participants can win each month, and winning nets you travel to Europe, five-star accommodations, cash for shopping and more. Black Diamond Casino is celebrating Christmas 2016 with a Christmas Carol theme. Play the games of Christmas past, present and future with just a $50 deposit. Then, get one Tournament Point for each $1 you wager on the Christmas Carol slot machine. The top prize is $5,000 cash, and 2nd and 3rd place win $2,500 and $1,000, respectively. New tournaments are available each month, such as a monthly raffle. For December 2016, the raffle is for a 75-inch Samsung television, and each $100 you deposit gets you three raffle tickets. There’s also a soccer-themed League of Champions tournament, and everyone’s automatically enrolled. In December, win that tournament to earn an official UEFA AC Milan jersey signed by Paolo Maldini. Get your $25 no deposit bonus from Black Diamond!